Slot car racing isn't just for kids anymore. 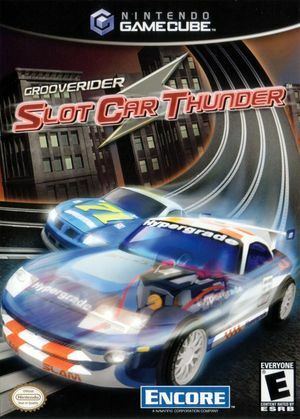 Set in a fantasy penthouse, Grooverider: Slot Car Thunder lets you experience quick lane changes, 360-degree loops, and crazy twists and turns on 20 slot car tracks. If you're a smart racer, you'll be sure to grab extra power-ups for a boost or blasting power. If you're not, then the tracks' spikes, mines, and other booby traps will surely be your downfall. In single- or multiplayer modes, you can get behind the wheel of any racecar, ranging from 1920s British cars to American stock cars. The graph below charts the compatibility with Grooverider: Slot Car Thunder since Dolphin's 2.0 release, listing revisions only where a compatibility change occurred. This page was last edited on 18 January 2018, at 14:25.